East Fife’s winter period will be busier than most, but that holds absolutely no concerns for club manager Darren Young. Instead the gaffer can’t wait to continue the club’s climb up League One while also helping them navigate through Irn-Bru Cup and Scottish Cup campaigns. East Fife booked a January date against Greenock Morton in the Scottish Cup by beating Berwick Rangers on Saturday, and will travel to meet Bohemians in the Irn-Bru Cup quarter finals on February 2. Young said: “It’s looking good for us and we have a squad big enough to cope with it all. The Fifers will resume their League One campaign on Saturday when Stewart Petrie brings his Montrose side to Bayview. This game, and the others around the corner, present a great chance for the Methil men to cement their place in the top four, according to the boss. “We have three from the next four league games at home and we’re looking to take maximum points and push up to the next level,” said the manager. 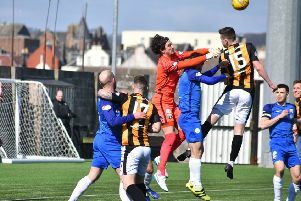 “Kevin Smith felt his calf before the Berwick Rangers game and we didn’t want to take a chance because we’re in a position now where we can call on Rory Currie, Anton Dowds or Jonny Court to come in. “I thought Jonny Court in particular played really well at the weekend and has been for the past few weeks. “He’s bringing people into the game and I’d like to see him now just get a goal or two for all of his work.